Copyright: © 2015 Rumi MKh, et al. This is an open-access article distributed under the terms of the Creative Commons Attribution License, which permits unrestricted use, distribution, and reproduction in any medium, provided the original author and source are credited. The results on crystallization of glasses of the cordierite composition, synthesized under the influence of concentrated radiant flux of different densities, are presented. Synthesis was carried out using a solar furnace or a solar simulator, wherein Xenon lamps of 10 kW power serve as a heat source. We studied glasses of the following stoichiometric composition 2MgO: 2Al2O3: 5SiO2 without a catalyst and with TiO2 as a catalyst. The initial raw materials were MgO, Al2O3 and quartz-kaolinite-pyrophyllite rock as a main source of SiO2. The natures of phase transitions in the samples obtained are studied using the X-ray analysis (DRON-UM-1) and the differential-thermal method (Derivatograph Q-1500 D). The absorption spectra are obtained on spectrophotometer SF-56. A comparison of the phase composition of the crystallized samples shows that the crystallization of μ-cordierite and the transition of μ-cordierite to α-cordierite in glasses, synthesized using a Xenon lamp, occurs at lower temperatures than those synthesized using solar radiation, provided the same conditions of synthesis and annealing. Besides of this, in glasses containing TiO2, the content of Ti3+ increases, and a decay of the concomitant phase, magnesium-aluminum-titanate, is activated at annealing temperatures above 1200°C. The differences in the character of the phase formation affect the activity of glass powders to sintering. It is found that peculiarities of the spectral composition of a Xenon lamp and the Sun affect the nature of the glass crystallization process. A presence of a significant proportion of extreme ultraviolet radiation initiates the crystallization process by the photo-activation mechanism and has the same effect as a rise of the glass crystallization temperature or an increase of the catalyst concentration. Peculiarities of crystallization of glasses in the system MgO: Al2O3: SiO2 have been studied in many researches. Particular attention has been given to the crystallization of glasses of the cordierite composition (2MgO: 2Al2O3: 5SiO2), since various glass-ceramic materials with an optimum combination of dielectric and thermo-mechanical properties are produced on its basis. The most common method of production of cordierite glass-ceramic materials is glass melting in electric or induction furnaces followed by subsequent crystallization. The crystallization of cordierite occurs through the formation of a sequence of intermediate phases. The temperature intervals of the formation and stability of the phases are changed depending on the conditions of synthesis and crystallization of glasses, as well as the type and concentration of catalysts. The effect of such factors, as temperature, time, gas atmosphere and the chemical composition of raw materials, on the properties of these materials has been studied in details [1-6]. In our study, the synthesis of glass is carried out under the influence of concentrated radiant flux from different types of sources. These conditions differ from traditional synthesis methods and can have a significant impact on the crystallization of glasses and the properties of subsequent glass-ceramic materials. However, studying the effect of short-wave radiation on the course of the crystallization of cordierite glasses has much less attention in the literature. The authors of [7,8] using a solar furnace for sintering the powder mixtures to obtain cordierite. At the same time, in work , it is shown that the largest acceleration of the crystallization process in production of lithium-silica-alumina glasses is achieved with use of Xenon arc lamps of different power. The authors believe that since at high temperatures the radiant heat transfer is realized in the glass, the presence of the radiant component of heat transfer initiates the crystallization process by means of the photo-activation mechanism. In paper , the effect of ultraviolet radiation on a formation of glass-ceramics in photosensitive glasses is studied. In our conditions, radiation exposure occurs during glass melting, which may also have some influence on the process of the crystallization and phase formation during subsequent heat treatment. The present work is devoted to the study of the crystallization of glasses of the cordierite composition, synthesized under the action of concentrated radiant flux, and some properties of glass-ceramics, obtained on their basis. The initial components of the glass batch is magnesium oxide MgO (рuriss), alumina Al2O3 (рuriss), as well as natural minerals as a source of SiO2. These minerals have different compositions, and they contain in addition to basic oxides of silicon, aluminum and magnesium on the average of 4.54 wt% of impurities (Fe2O3, Na2O, K2O). In this study, a quartz-pyrophyllite-kaolinite rock is used as a silica-containing material (Table 1). Table 2 shows the batch composition for synthesis of a glass of the following stoichiometric composition (2MgO: 2Al2O3: 5SiO2) wt %. Table 1: Chemical and mineralogical composition of the quartz-kaolinitepyrophyllite rock. Table 2: The batch composition for production of the glass of the composition 13, 78 MgO: 34.86 Al2O3: 51.36 SiO2 (wt.%). Siliceous raw materials (quartz-kaolinite-pyrophyllite rock) are pulverized preliminarily to particles of the size less than 100 microns. Aluminium oxide is burned annealed at 1450-1500oC for the transition into a stable α-form. The initial components are weighed according to the calculations. Then the mixture is stirred with simultaneous additional grinding in a planetary ball mill to achieve a grind fineness of 5-10 microns. The resulting powders are molded for subsequent glass melting. We investigate glasses of the stoichiometric composition, as well as those supplemented with 12 wt% titanium dioxide (over 100%) as a crystallization catalyst. The X-ray analysis, the differential-thermal method and optical methods are used to analyze the synthesized materials. The X-ray analysis is performed on the diffractometer DRON-UM 1 (Cu Kα radiation, and Ni-filter). Derivatograph Q-1500 D is used for the differential thermal analysis (DTA). The heating rate used is 15°C/min. Measurements are carried out up to a temperature of 1200°C. Absorption spectra are studied with SF-56 spectrophotometer in the wavelength range of 100–1000 nm. The resolution of the device is 0.3 nm. Previously, our research [11,12] has shown that during the synthesis of glasses of the cordierite composition under the influence of concentrated radiant flux, the crystallization of α-cordierite occurs through the formation of solid solutions with the structure of hightemperature quartz (quartz-O) and μ-cordierite. On the DTA curves, obtained on the crushed granular samples, the presence of diffuse exothermic peaks in the temperature ranges 700-900°C and 900- 1000°C and most pronounced at 1040-1050°C are observed (Figure 1). According to the X-ray analysis, the peaks correspond to the crystallization of the aforementioned phases. In addition, as can be seen from derivatograms, the temperature of exoeffects and their profiles are changed depending on the density of radiant flux and the type of the radiation source. Figure 1: DTA curve fragments of 2-3 mm granules; a,b) flux density 250 W/ cm2, c,d) flux density 600 W/cm2. The X-ray phase analysis of the coarse-grained samples shows (Figure 2) that during the synthesis of glass of the cordierite composition in the absence of catalysts with the use of a Xenon lamp, the crystallization process of μ-cordierite in coarse-grained samples starts at 880°C (density of the radiant flux is 250 W/cm2). 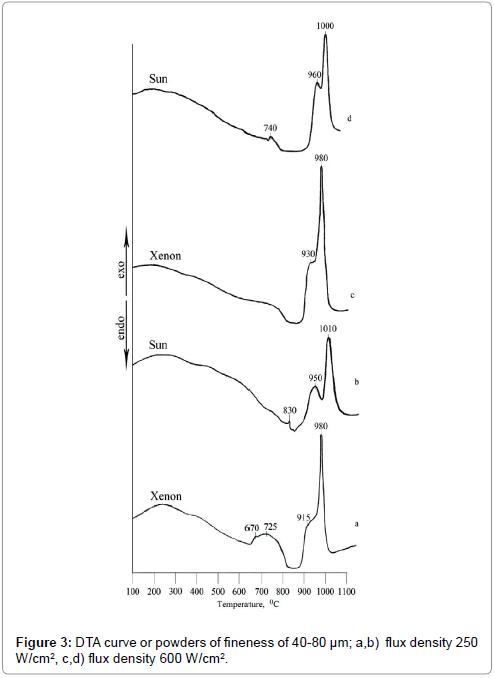 Figure 2: X-Ray diffraction patterns of cordierite composition glass samples: А) heating sources is Xenon lamp, В) heating sources is Sun; а,e) flux density 250 W/cm2, annealing temperature 880-900°C; b,f) flux density 250 W/cm2, treatment temperature 980-990°C; c,g) flux density 600 W/cm2, annealing temperature 880-900°C; d,h) flux density 600 W/cm2, annealing temperature 980-990°C. With a significant overheating of the melt, which corresponds to the flux density of 600 W/cm2, the amount of crystallizing μ-cordierite increased sharply, while at 980°C the only crystalline phase is α-cordierite, regardless of the flux density. For traditional methods of synthesis of glasses of the cordierite composition, the rate of crystallization of μ-cordierite is extremely small. At a temperature of 850°C, it takes at least 150 hours for μ-cordierite to begin to crystallize . This process is activated under the action of radiant flux. During the synthesis of glass in the solar furnace, the crystallization begins at higher (by ~ 20°C) temperatures. At the annealing temperature of 880-900°C (flux density of 250 W/cm2), there are no crystalline phases on the difractograms and at the annealing temperature of 980-990°C, μ-cordierite is the main phase component. For glasses synthesized under high radiant flux density (600 W/cm2) during annealing at 880–900°C, the crystallization just begins and μ-cordierite remains at the annealing temperature 990°C. To complete the transition μ → α, it is necessary to increase the annealing temperature above 1000°C regardless of the degree of overheating of the melt. A sharper rise of the branch of exothermic effects, a narrow profile and an increase of the peak area, as well as the decrease of corresponding temperature in the DTA curves indicate an increase of the rate of the crystallization process with increasing of flux density, while using the Xenon lamp. By utilizing powder samples, the phase composition is not changed, but the ratio of the crystallizing phases is changed, showing an increase of μ-cordierite amount. In the DTA curves, the high-temperature exothermic peaks have more distinct forms indicating the surface crystallization of the glass in the absence of catalysts (Figure 3) . Figure 3: DTA curve or powders of fineness of 40-80 μm; a,b) flux density 250 W/cm2, c,d) flux density 600 W/cm2. A similar effect of radiation was observed for glasses with additions of titanium dioxide as a catalyst. It should be noted that the color of titanium-containing glasses changes from black to yellow. Black glasses are obtained in synthesis in radiation of a Xenon lamp, while yellow glasses are obtained in synthesis in the solar furnace. On diffractograms of crystallized glasses, in addition to the μ- and α-cordierites, the presence of magnesium-aluminum-titanate (a solid solution nAl2TiO5 ∙ mMgTi2O5) is observed, and its amount increases with increase of content of titanium dioxide . It is found that the synthesis of titanium-containing glasses under the action of radiation from a Xenon lamp in comparison with the solar radiation leads to a decrease of temperature of the corresponding phase transformations during subsequent crystallization from a μ-cordierite to α-cordierite, and at higher temperatures to accelerating of disintegration of magnesium-aluminum-titanate and formation of rutile. It is necessary to note that the phase composition of crystallized glasses with 12 wt % TiO2, synthesized using the solar furnace, corresponds to the glass composition with 5-10 wt % TiO2, crystallized at the same temperatures, but synthesized using a Xenon lamp. Effect of radiation on the phase composition of the crystallized glasses is revealed in the ability of the glass powders, containing 12 wt % TiO2, to sintering. A comparison of these results with those obtained from the X-ray analysis shows that the degree of sintering depends on the phase composition of the material. An appreciable reduction of water absorption is found only for the samples in which a transition from a metastable modification of cordierite to a stable α-form has been completed. Further intensification of the sintering process occurs with the decomposition of magnesium-aluminum-titanate. 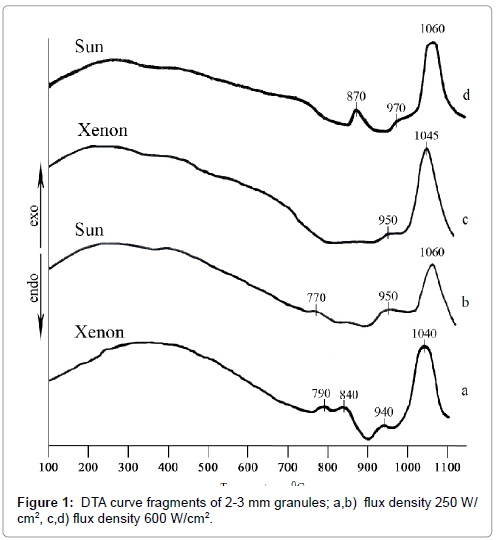 It is found that the glass powders, synthesized by using a Xenon lamp, are sintered better than those synthesized in the solar furnace (Figure 4), having the same conditions of synthesis and heat treatment. 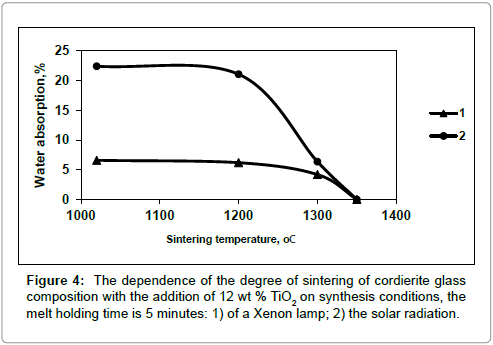 Figure 4: The dependence of the degree of sintering of cordierite glass composition with the addition of 12 wt % TiO2 on synthesis conditions, the melt holding time is 5 minutes: 1) of a Xenon lamp; 2) the solar radiation. Analysis of the absorption spectra shows peculiarities due to the influence of different contents of titanium dioxide, as well as the nature of ionizing radiation. According to the previous works , the absorption band at 400-600 nm corresponds to Ti3+. As shown in Figure 5, the intensity of the absorption band for glasses, obtained in the synthesis using a Xenon lamp, increases with increasing content of TiO2, which may indicate an increase of the concentration of Ti3+. In this case, the optical density of the glass is increased as well. This fact, along with a shift of the absorption band edge to longer wavelengths, can mean the system disordering. At the same time, this absorption band is practically absent in the cordierite glass (12% TiO2), synthesized in the solar furnace. The nature of the curve of the latter spectrum is more like the absorption spectrum of a glass with less TiO2, synthesized using a Xenon lamp. 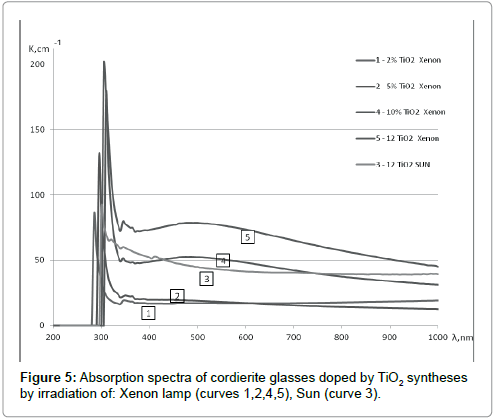 Figure 5: Absorption spectra of cordierite glasses doped by TiO2 syntheses by irradiation of: Xenon lamp (curves 1,2,4,5), Sun (curve 3). All absorption spectra have peaks in the region 350-370 nm, and the intensity of peaks remains constant for all of the samples. The origin of the peaks is difficult to identify unambiguously. According to , the absorbance at 350-370 nm, along with the absorption band of 400-700 nm may be due to the presence of Ti3+. However, in this case, a correlation of the intensity of these peaks with percentage of TiO2 should be observed. More likely, the peaks are associated with Fe3+  due to the presence of Fe2O3 in the initial silica-containing materials. At the same time, there is a possibility of the formation of complex defects of FTi type, where F is the center near the titanium ion that replaces Al3+. It is known [17-21] that UV radiation has a photo-catalytic influence on a material, which results in a change in the material properties. In our case, this influence occurs at the stage of melting and glass synthesis that leads to the formation of structure imperfections, both on the surface and in the bulk of the melt. One of the effects of such an influence is the formation of anionic vacancies (in this case oxygen vacancies). In the presence of the transition d-elements in a glass, this process results in the possibility of formation of low-valent cations due to the capture of a free electron, for example: e- + Ti4+ → Ti3+ . In a cordierite glass without a catalyst, a formation of paramagnetic defects is due to the presence of trace contaminants , in particular Fe2O3, because of the use of mineral raw materials as a source of SiO2. Introduction of TiO2, as a catalyst, results in an increase of the concentration of such defects, including the formation of different complexes based Ti3+ (Ti3+-Fe3+, Ti3+-Fe2+, Ti3+-Al3+ and so on). Changing the glass structure induces inhomogeneity, promoting segregation. A subsequent thermal treatment of such glasses leads to a bulk fine-grained crystallization with a release of the titanium-containing phase, and, consequently, to improvement of properties of the glass-ceramics. Thus, the mentioned differences in the rate of crystallization and the nature of phase formation of the glasses studied are quite justified if we take into account the features of the spectral composition of the Xenon lamp and the sun. In particular, the spectrum of the Xenon lamp have a large proportion of extreme ultraviolet radiation in the wavelength region of less than 0.3 micron, which increases the crystallization process due to the photo-activation mechanism . It is found that the crystallization of a glass of the cordierite composition, synthesized by the action of concentrated radiant flux depends on the type of a heat source, along with other known factors. Short-wave radiation activates the crystallization of μ-cordierite, the phase transitions (μ-cordierite to α-cordierite, decay the concomitant phase magnesium-aluminum-titanate in glasses containing TiO2) and it has the same effect on the processes of crystallization as a rise of the temperature of the glass crystallization or an increase of catalyst concentration. The authors thank Dr. E. Ibragimova for help with the spectrophotometric experiments. Jo S, Kang S (2013) TiO2 effect on crystallization mechanism and physical properties of nano glass-ceramics of MgO-Al2O3-SiO2 glass system. J Nanosci Nanotechnol 13: 3542-3545. Demirci Y, Günay E (2011) Crystallization behavior and properties of cordierite glass-ceramics with added boron oxide. J Ceramic Process Res 12: 352-356. Marikkannan SK, Ayyasamy EP (2013) Synthesis, characterisation and sintering behaviour influencing the mechanical, thermal and physical properties of cordierite-doped TiO2. J Materials Res Technol 2: 269–275. Shamsudin Z, Hodzic A, Soutis C, Hand RJ, Hayes SA, et al. (2011) Characterisation of thermo-mechanical properties of MgO–Al2O3–SiO2 glass ceramic with different heat treatment temperatures. J Materials Sci 46: 5822-5829. Wang ShM, Kuang FH, Li J (2010) Influence of different Fe2O3 content on crystallization of MgO–Al2O3–SiO2–TiO2 system glass-ceramics. Phase Transitions: A Multinational J 83: 397-403. Oliveira FAC, Shohoji N, Fernandes JC, Rosa LG (2005) Solar sintering of cordierite-based ceramics at low temperatures. Solar Energy 78: 351–361. Xiaohong Xu, Xionghua Ma , Jianfeng Wu , Ling Chen , Tao Xu , et al. (2013) In-Situ Preparation and thermal shock resistance of mullite-cordierite heat tube material for solar thermal power. J Wuhan Univf Technol Mater Sci Ed 28: 407-412. Berejnoi AP, Iltchenko LN (1968) Issledovanie natchalnih stady sitalloobrazovaniya v svetotchuvstvitelnih steklah. Neorganitcheskie materiali 4 : 584-589. Adylov G, Akbarov R, Singh D, Zufarov M, Voronov G, et al. (2008) Crystallization of μ-and α-cordierite in glass obtained via melting by concentrated radiant flux. Appl Solar Energy 44: 135-138. Adylov G, Akbarov R, Singh D, Zufarov M, Voronov G, et al. (2009) Crystal glass materials based on catalyzed cordierite glass synthesized under exposure to concentrated radiant flux. Glass and Ceramics 66 : 120-124. Peter Warwick McMillan (1979) Glass-ceramics. Academic Press. Müller R, Naumann R, Reinsch S (1996) Surface nucleation of μ-cordierite in cordierite glass: thermodynamic aspects. Thermochimica Acta. 280- 281: 191-204. Nijankovsky SV, Sidelnikova NS, Baranov VV (2015) Optitcheskoe pogloshchenie i centri okraski v krupnih kristallah Ti : sapfira, virashchennih metodom gorizontalnoy napravlennoy krisstallizacii v vosstanovitelnih usloviyah. Fizika tverdogo tela 57: 763-767. Aseev VA, Nekrasov YA, Homtchenko KV (2010) Obescvetchivanie prirodnih sapfirov. Nautchno-tehnitchesky vestnik Sankt-Peterburgskogo gosudarstvennogo universiteta nautchnih tehnology. mehaniki i optiki 2: 86-89. Laguta VV, Glintchuk MD, Slipenuk AM, Bikov IP (2000) Navedennie svetom sobstvennie defekti v keramike PLZT. Fizika tverdogo tela 42: 2190-2196. Dzwigaj S, Nogier J-Ph, Che M, Saito MT, et al. (2012) Influence of the Ti content on the photocatalytic oxidation of 2-propanol and CO on TiSiBEA zeolites. Catalysis Communications 19: 17-20. Lombard P, Ollier N, Boizot B (2010) EPR study of Ti3+ ions formed under ionizing irradiation in oxide glasses. Glass & Optical Materials Division Annual Meeting. Ollier N, Lombard P, Farges F, Boizot B, (2008) Titanium reduction processes in oxide glasses under electronic irradiation. J Non-Crystalline Solids 354: 480-485. Hadakovskaya RY ( 1978) Himiya titansoderjashchih stekol i sitallov. M: Chimiya. Kozelkin VV (1985) Osnovi infrakrasnoy tekhniki. M Mashinostroenie.